One need not be a zealot in the human rights field to find the latest turn in Indonesian politics disconcerting. 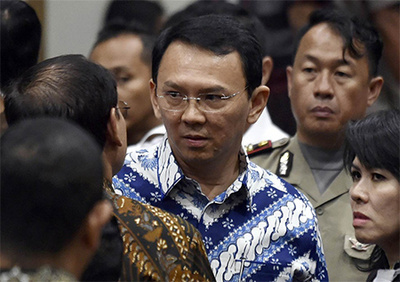 Jakarta’s governor, Basuki Tjahaja Purnama, known as Ahok, was always a nicely packaged target, confident and assertive, very much the beaming confident politician. Being Chinese was one aspect of problem; being a non-Muslim was the other. From that standpoint, vulnerabilities were always going to be emphasised, and slipups pounced upon ruthlessly. Indonesia’s post-colonial history is littered with bloody spectaculars, featuring outbursts of sectarian atrocity or state-directed massacres of political opponents. Ahok’s case is not in that league, but it opens a window to it, shining dark rays of foreboding as to what might come. At times, for instance, in 1998, the Chinese minority has found itself to be a convenient target of spoilation and vengeance. As with much theological disputation, there is no agreement, sensible or otherwise, on this point, and the argument that such a passage requires a current modern interpretation is sorely needed. The fundamentalist roadblock here, however, is a formidable one indeed. When linked to political opportunism, it becomes lethal. Unfortunately for those willing to engage in any sensible debate, the good deputy was referring to the hirabah verses, which stress punishment of such crimes as sedition, piracy, robbery and highway robbery. Islamic State followers would have approved, given their own reference to those passages in justifying their treatment of the infidel. Individuals such as Rizieq Shibab of the Islamic Defenders Front (FPI), twice imprisoned for inciting violence, also smelt blood, shifting the focus away from soft-headed clericalism to the Koran itself. Protests were organised, and the fever, once stirred, concerned Indonesian authorities. The trial gave an inkling that Ahok might still have his day, receiving the lightest of sentences. The prosecution team were not convinced that he had ever intended to insult Islam, and for that reason, pushed for a suspended sentence. The defence were buoyed, and it was one marked by curious references, not least of all the comparison, made by Ahok himself, to the resilient clownfish Nemo, who braves against the current. His supporters were also to be found aplenty, spanning the spectrum. City Hall was assailed with decorative flower boards and balloons festooned with messages of encouragement. Even for various Muslims, Ahok was their man. The five judges of the North Jakarta District Court, donning faces and views of severity, thought otherwise, conforming to a long pattern that tends to find blasphemy even where there is none. They were already under pressure from such groups as the National Movement to Safeguard the Indonesian Ulema Council’s Fatwa (GNPF-MUI) to impose the maximum sentence of five years. Rizieq, who had also been a witness for the prosecution, made his views felt. Ahok was to be made an example of, deserving a jail sentence for having deliberately made a nuisance of himself in his position as governor. Not only had he blasphemed with intent; he had also threatened public order. Judge Abdul Rosyad was in a particularly scolding mood, detecting a certain lack of guilt on Ahok’s part. “As Governor, as a public officer, the defendant should have known that religion is a sensitive issue so he should have avoided talking about religion.” Not that this meant opponents could not use religion, or at least its pretext, in terms of framing their opposition to Ahok. As ever, the victim in this case deserved punishment rather than protection. Lynch mob justice is never pretty, and resisting it, if not scotching it altogether, is the hallmark of maturity. It has been a maturity that the current Indonesian president praises, and one seen to have emerged in the post-Suharto era. Scratching the surface reveals otherwise, a society of tinder waiting to catch fire and conflagrate. The Indonesian government, aware of this, is seeking to have the agitating, pro global-Caliphate group Hizbut Tahrir Indonesia, disbanded through the courts. But for Ahok, this whole process has meant one thing: the establishment was going to give the protestors what they wanted, though others would have preferred something more appropriately savage.